The two entrepreneurs were picked on the basis of their creativity and innovativeness in the areas of biotechnology and solar energy, two areas that fall within the Government’s Big 4 development agenda. Ms Nafula, a University of Nairobi Bachelor of Science in Microbiology and Biotechnology graduate, is the founder and Chief Executive Officer of the Crystal River Products which manufactures bio-based beauty and hygiene products. Her company seeks to be the leading producer and supplier of the best bio-based beauty and cleaning products in the world. Wadongo is a young engineer who designed a solar-powered LED lantern called Mwanga Bora, an invention which is fast replacing smoky kerosene lamps and firelight in rural Kenya. He has been distributing thousands of these lanterns throughout rural Kenya where there is inadequate electricity supply or no connections at all. Wadongo’s organisation, Sustainable Development For All (SDFA) sponsors an empowerment initiative that teaches poor Kenyans how to reproduce these solar lanterns and sell them for profit. 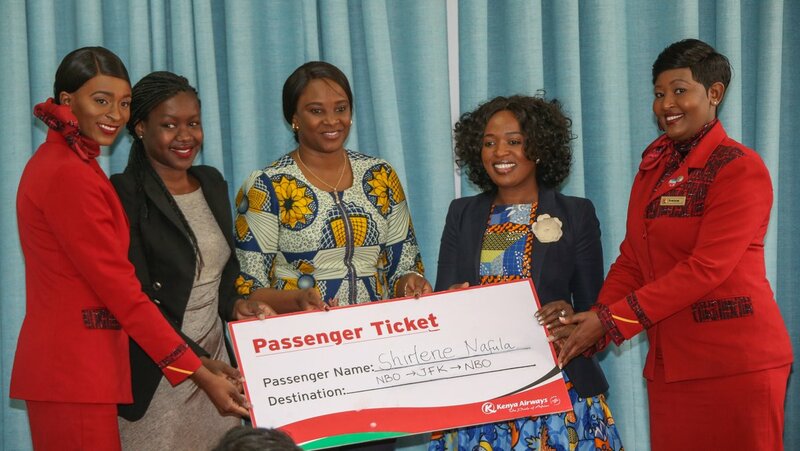 Ms Muhati said Kenya Airways expects the two young business people to travel, learn, meet and network with counterparts and return with new ideas that can inspire more youths. With the commencement of the direct flight to New York, Kenya joins a small group of African States like South Africa that operate similar flights to the US. The Nairobi to JFK International Airport long-haul flight will last 15 hours representing an over seven hour reduction from the current travel time between the two cities. Hundreds of travellers have booked seats on the direct flight to New York ahead of the inaugural journey. The bookings are spread across the remaining weeks of the year especially the December Holiday season. Two young innovators to join 470 passengers on inaugural direct KQ flight to New York Reviewed by samrack on October 19, 2018 .